Talan Products’ supervisor Frank Lowe grabs a tool off one of the firm’s die carts designed as part of the firm’s recent 5S and quick-die-change initiatives. extol the virtues of lean manufacturing. The benefits—reduced costs, less scrap and improved customer service, to name a few—are well documented. But few small manufacturers are implementing “lean.” Maybe it seems like a big-company strategy requiring the hiring of consultants and additional training, and maybe it seems like it’s just not for your company. After all, everybody talks about the Toyota Production System but is anybody telling us what assembling cars and stamping metal parts have in common? Or, maybe it’s just the name of the concept itself. After all, you’re probably pretty lean as it is. None of the above-mentioned issues were a problem for executives at metalformer Talan Products, Cleveland, OH, where CEO Steve Peplin, president Pete Accorti and VP of manufacturing Pat Parziale explained their recent success implementing lean strategies. The leadership team developed a set of measures used throughout the project to gauge performance improvement. Among the metrics: inventory turnaround, measures of equipment, tooling, and personnel availability, scrap and direct labor efficiency. The leadership team committed to posting, every month, easy-to-read charts to track the metrics. In addition, the team still meets to discuss progress on the metrics at the start of each month. 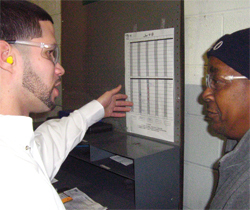 Supervisor Miguel Lugo (left) and press operator Mark Adams discuss Mark’s real-time hour-by-hour performance as marked on the chart. Hourly, Mark notes on the chart any problems he might be experiencing and supervisors review the charts and collaborate with the operators to solve the problems. The 5S tool addresses workplace flow and organization, focused on sorting, straightening, shining, standardizing and sustaining. More than a housekeeping program, 5S initiatives address a variety of important factors including workplace safety, material and information flow, preventive maintenance, standardized work instructions, inventory control and purchasing procedures. 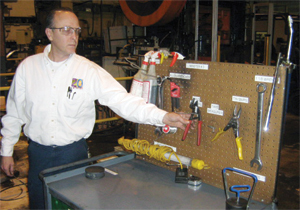 The 5S workshops highlighted the importance of preventive maintenance on presses and auxiliary equipment. They also focused on the importance of organizing and standardizing die-change tooling. For example, the 5S teams put into use a series of die carts, and also color-coded clamps and other tooling. “We also found that we had to audit weekly to keep the 5S program energized,” adds Parziale. The 5S workshops introduced visual factory methods at Talan Products. For example, operators were expected to record oil pressures each hour. In doing so, many stated that the gauges were too small and were located such that they were hard to read. As a result of 5S, the firm invested in larger gauges that were relocated so that they became easier to see and read. Operator compliance with the task of recording hourly pressures increased. In yet another example of developing a visual factory, large charts were posted at each press so that operators can easily record, hour by hour, production statistics. The charts also provide space to write comments and problems. And, not to be overlooked, the charts were designed to be clearly seen at a distance. Checking the charts throughout the day, supervisors and managers can see how each operator is doing and quickly identify any problem areas. “The charts have helped us identify and address operating problems much more quickly that we did in the past,” admits Parziale. 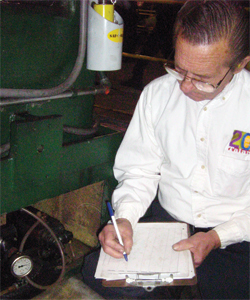 Talan’s Gene Sawyer takes an hourly reading from a press’s oil-pressure gauge. As part of the firm’s directive to implement a “visual factory,” it replaced its previous gauges with larger gauges, and repositioned them to allow easier and more accurate readings. Quick-die change (QDC) is another important lean tool, focusing on reducing eliminating delays and errors. Talan worked to reduce changeover times not by admonishing operators to work faster, but by asking for and implementing their ideas to simplify changeovers. “We received good feedback after each of our QDC workshops,” reports Peplin, “which were all very hands-on and participative.” Parziale agrees: “The workshops didn’t just cover theoretical principles where we just hoped that our operators and supervisors would apply them at some point. Instead, they actually went to the presses and conducted die changes, returned to the conference room to discuss ideas for improving the procedures, and then went back out to the floor to try them out. The QDC workshops illustrated the importance of coordinating activities between several departments within Talan Products. In the end, the company found that actually changing dies didn’t take a lot of time, particularly after implementing 5S activities and organizing die-change carts. Instead, big reductions in changeover time came thanks to coordination among production, tooling and quality control. With 5S and QDC initiatives successfully under its belt, Talan Products’ management team then set its sights toward value-stream mapping (VSM)—creating a process flow map that it can use to highlight and contrast value-added and non-value-added steps. Parts sitting on the shop floor awaiting material handling is a nonvalue-added step, as is waiting for a die to become available. Following a brief introductory lesson on VSM, the firm’s steering committee chose a target product and selected a VSM team, which included Accorti.